Marc Levinson’s The Box was published seven years ago. The book’s a classic about how the shipping container changed the world. The container revolution began in the 1950s during the Eisenhower era. Marc Levinson, an economist, puts a precise date on the first shot in this revolution. On April 26, 1956, a crane in New Jersey lifted 58 container boxers onto a ship to Houston and container traffic surged with new orders. The post World War Two era fitted perfectly, and more importantly, economically, into a container box. The Defense Department, led by business whiz and the very brightest of The Best and Brightest Robert McNamara, used containerization as a revolutionary logistical tactic to beat back the Communists in Vietnam. That was the plan. McNamara’s logistical engineers created new supply lines to the other side of the world with containers, allowing the Vietnam War to continue for several more years, which wasn’t part of the plan. Not everything fits in a box. Read Seth Godin’s Poke the Box. 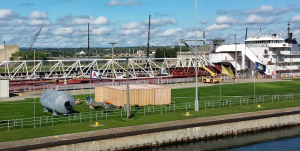 The Soo Locks in Michigan’s Upper Peninsula is in the running for an 8th Wonder of the World contest sponsored by Virtual Tourist. Sleeping Bear Dunes is the other Michigan entry. 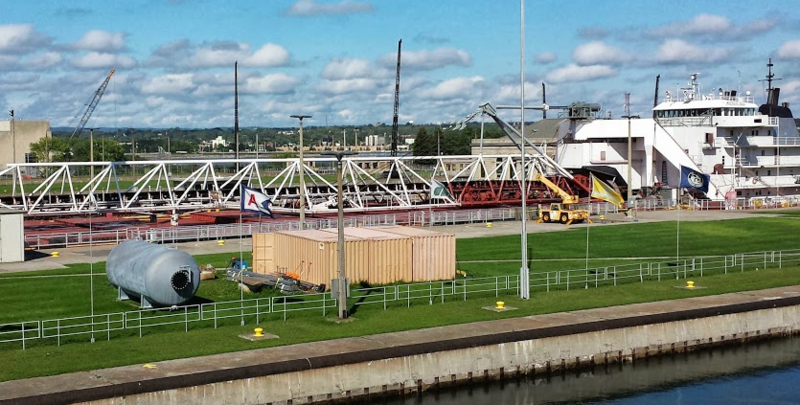 The 11,000 ships that pass through the Soo Locks must navigate the 21 foot drop between Lake Superior and Lake Huron. The ship in the picture is 1,000 feet and transports mostly iron. The Locks are a remarkable engineering accomplishment but Sleeping Bear Dunes gets my vote for what the glaciers did in shaping this part of the Lake Michigan shoreline. Shaped by nature is preferred to containment. Seth Godin writes a lot about the death of the Industrial Age. Michigan’s industrial decay is in such contrast with its natural beauty. The auto industry relies on the container box like McNamara’s logistical engineers. On the way to the Soo, I went into a grocery store near an abandoned auto plant. An elderly man approached me and asked if I could help him. His wife had died recently and he didn’t know how to do laundry. He wanted to know what laundry detergent to buy and how to measure it. He said he had worked at General Motors. Everything about his old way of life was gone. He had to start over, and do it alone. The post Industrial Age has left Michigan with a lot of prisons and casinos. The highway signs seem to either promote a casino or warn of a prison nearby. I saw the signs for Sleeping Bear Dunes on the way home and though it was getting late, decided to make a climb up the dunes. I noticed the wind always likes to be in your face on the way up the hills you must climb, and seduce you to turn around and go down with the wind at your back. The rain was a bonus. The signs warned to stay on the trails. What trails? I was alone at the late hour, and in a hurry to get back home. I didn’t see any trails and didn’t have much time to look for one. I looked straight up the dunes and thought what the hell, if you want to go up, you have to go up. The dunes changed from hills to mountains halfway up and into a canyon at the first hill when I realized that I had gone the wrong way and the spot where I should have gone was way the hell over there. I didn’t have quite the reaction of Lewis and Clark when they stumbled on the Grand Canyon blocking their path, but I wondered if I should quit and turn back or just die on the side of a dune and let the sand bury me as in the Legend of Sleeping Bear. I had climbed too far to quit, but was too tired to go much farther, and unsure how far to go. It was also getting dark and rain clouds were gathering off Lake Michigan to torment this idiot climbing up Sleeping Bear Dunes alone. The story of Sleeping Bear Dunes is that a mother bear and her cubs were forced into Lake Michigan to avoid a terrible forest fire. They swam for hours and mother bear finally made it to shore. Her cubs were too exhausted and drowned as she watched from shore. The Great Spirit Manitou shaped the dunes and the two islands in a symbol of faithfulness. Determined to climb to the top, I continued in the wind and rain. Finally making it to the top, I wanted to do a Rocky celebratory dance. Then I heard noise coming from over the dune. A father was playing with his little boy. A guy was taking pictures of his girlfriend. Two girls were giggling and walking down the trail. I stared and realized I was alone only because I had taken the idiotic way up.